What could be better than a gift giveaway on Beltaine? Fiona‘s Scottish day of celebration, but one that is recognized in so many other cultures in the world. Baskets full of flowers. May-pole dancing and festivities. Joy in the burgeoning sunshine and exploding greenery. And my beloved Grandmother’s birthday. It is also Texas and I awoke to greet the day of overcast skies, rain, and wind. But no worries. It is warm and the rain will enliven the green. I never moan about rain–our greatest source of freshwater and life giving force. And it is May 1–one month and twelve days until the day. Publication day. Today is a day to enjoy by doing something that makes you happy. Go outside. Feel the breeze. Smell the flowers. Bask in the sun or let the rain fall gently upon your skin. Leave behind the cares you’ve been carrying all winter. Feel the gratitude of being alive. And sign up for my newsletter to win a chance at my May Day Celebration Giveaway. 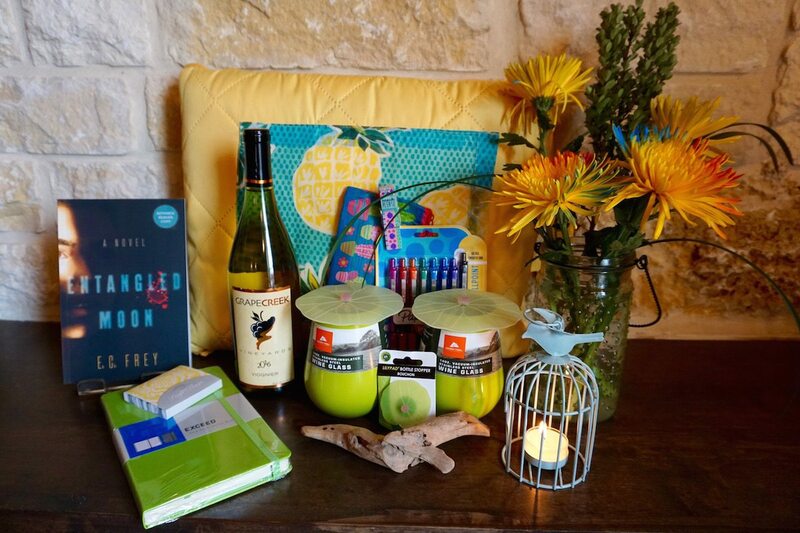 I am giving away a signed copy of an Advance Reader’s Copy of Entangled Moon: A Novel, a folding outdoor blanket with carry handle and pocket in cheerful yellow and welcoming pineapples for an outdoor reading outing, a lime green dotted book journal and multi-colored inkjoy pens to proclaim your inner muse, citrusy page flags (to highlight the most memorable passages), 2 lime green Ozark Trail vacuum-insulated stainless steel wine glasses (because this is wine country as you will discover in my blog thread Nourishing the Soul), 2 Charles Viancin lilypad drink covers (because it is the beginning of bug season), 1 Charles Viancin lilypad bottle stopper, and 1 mystery treat. I will pick the winner on May 8th which is my husband’s birthday. Hope to see everyone then. I write corporate suspense thrillers that I hope are imbued with the power of hope. How could I resist? Just signed up. I cannot wait to read it! All the best, looking forward to seeing you soon! 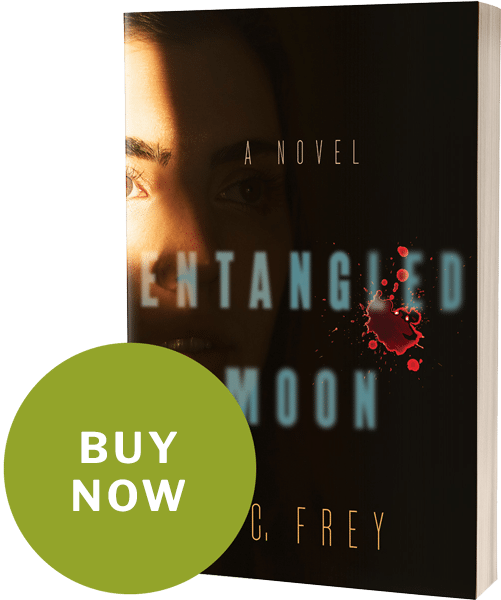 I would love to read Entangled Moon! Subscribed, thank you for the chance to win this wonderful May Day Celebration Giveaway. I just sign up and shared on fb . This is an Awesome giveaway. Good much to all.